Get your driving gloves on, your best pair of sunglasses and maybe a leather jacket as we take a trip into the imagination for the greatest race of all time. This little race of mine involves 3 of the usual suspects, the Lamborghini Murcielago, the Ferrari F430 and the Maserati Granturismo. Let’s have a look at each cars vitals. The Murcielago The Murcielago we are using is the Murcielago LP 670-4 SuperVeloce. This particular Lamborghini Murcielago features a V12 engine which can generate 670 PS (493 kW; 661 hp) at 8000 rpm. With that kind of power the Murcielago is capable of some pretty impressive speed. It can hit 60 mph in 2.8 seconds, has a quarter mile time of 10.9 seconds and a top speed of 214 mph! This is some serious speed. Things are looking pretty positive for the Lambo, but there have been some complaints about the cars four wheel drive system which makes it quite hard to take the Murcielago to its limit. The F430 we are going to use is the F430 Challenge. It features a 4.3L V8 engine which delivers 515 PS (379 kW; 508 hp) at 8500 rpm. Now this isn’t as powerful as the Murcielago and that reflects in the F430s speed stats. 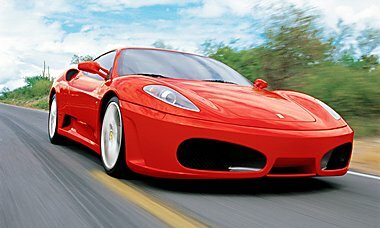 The Ferrari F430 Challenge can do 62 mph in 3.6 seconds and offers a top speed of only 202 mpg. This is still lightning-quick, and many feel more confident pushing the F430 to the limit, which could be where the Murcielago could suffer, bearing in mind that this is not just a drag race and there will be corners. Now for the Dark Horse, the proverbial tortoise in a race of hares, but can slow and steady win the rest. Well it’s not that slow or steady, so maybe. On paper the Maserati Granturismo is the worst of the three. It has a 4.7L 460 HP V8 engine that can push the Granturismo to a Top Speed of 188 mph which is considerably less than the Murcielago. But remember they will rarely be going at top speed as there aren’t many long straight on the track I have in mind, I’m thinking of something similar to the Nurburgring. So what do you think… Who will win! ?